Amber Rose & Blac Chynas upcoming reality series with MTV has been scrapped and sources say that Kim Kardashian may be behind it. Reality Fight! Inside Kim Kardashian’s Plan To Stop Amber Rose & Blac Chyna’s MTV Show. 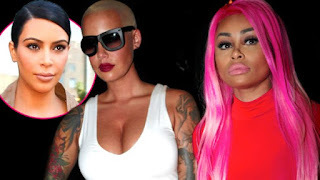 Kim Kardashian‘s worst nightmare has come true after her hubby Kanye West‘s ex, Amber Rose, and Kardashian family enemy Blac Chyna revealed that they will be starring in an upcoming reality show on MTV. Because of the duo’s intense dislike of theKeeping Up With The Kardashians clan, ” Amber and Blac Chyna will definitely be verbally going after the Kardashians on TV,” the source said. As of late, Rose has focused her attention on Khloe Kardashian, however, after she was attacked by the outspoken sister for talking about Khloe’s younger sister Kylie Jenner‘s relationship with Tyga, who also happens to be Blac Chyna’s baby daddy. On top of that, Khloe is now dating yet another one of Rose’s ex-boyfriends, as Radar recently revealed that James Harden is an ex lover of the bald-headed former stripper. Do you hope that Amber Rose and Blac Chyna use their airtime to trash the Kardashians? Tell us your thoughts in the comments below.